In an interview with Adam Garrie from the Duran, Syrian political commentator Afraa Dagher reminds us of the reality in Syria, which is far removed from MSM media mythology. “the US is not fighting any “ISIS” and the same goes for Turkey. They are the real enemies of Syria. The USA along with Jordan and Israel, worked hard to control the southern border of Syria and created mutual military rooms in order to restrain Syria’s anti-terrorist efforts. The US goal is to advance towards DeirAlZour which is rich in oil, and which is important for Qatar to supply its oil to Europe across the Syrian Land , which will impact the importance Russian oil for Europe. NATO and its allies are the terrorists in Syria. (This has been known and documented for over six years, and it was revealed well before the dirty war started.) Syria and its allies, on the other hand, oppose the terrorists. Former DIA chief Michael Flynn admitted that the West’s support for terrorism was willful. In the following video, a former FSA General admits to working closely with Jabhat al-Nusra and ISIL. In a May 8, 2017 article, “Democracy Now Launches Anti-Syria Propaganda Campaign”, Miri Wood reminds us of other public admissions which have been willfully erased or suppressed from the collective memories of so many in the faux-Left camp. The accumulated evidence of the West’s support for terrorism in Syria is staggering. Books, including Prof Anderson’s The Dirty War On Syria: Washington, Regime Change and Resistance and the author’s Voices From Syria present enough factual evidence and historical context to remove any reasonable doubt about the true nature of the war, and the West’s unequivocal support for terrorism in Syria. Despite all of the publicly available evidence, so-called “progressives” in the West have been successfully co-opted. Feminists are tacitly supporting Wahhabism and Sharia law when they support the war on Syria. Progressives of all brands are supporting terrorism when they support the war on Syria. Ostensibly progressive shows such as Democracy Now, and iconic “progressive” intellectuals, all serve to coopt the “progressives” when they parrot unsubstantiated propaganda memes that demonize President Assad, Syria, and Syrians. Ironically, North American faux-Liberals and faux –progressives are advancing criminal neo-con war-mongering and a neo-con agenda when they support the West’s dirty war on Syria. Self-styled “progressives” support refugees but totally ignore the fact that their support for their government’s criminal warfare creates the refugees in the first place. Progressives should be opposing the warfare that creates the refugees. The warmongering elites intend to destroy Syria, as they destroyed Libya, Iraq, and Ukraine, with a view to enriching narrow interests and serving the diktats of the “market”, all to the disadvantage of humanity. 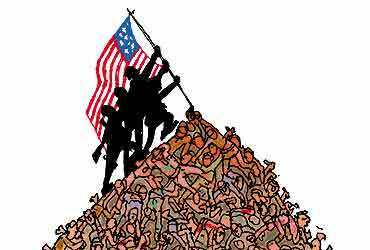 The criminal war on Syria, which could easily escalate into widespread nuclear war, is a war on all of us. It is part the neo-con project of globalization, which requires global militarization, globalized terror proxies, a global bogeyman (ie ISIS), and a global rejection of the rule of international law.